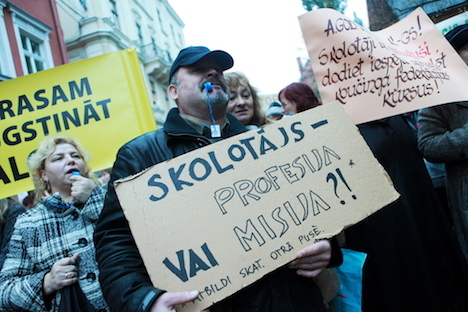 A day before teachers’ planned protest act Latvian politicians failed to convince Latvian Trade Union of Education and Science Employees about the options to find money to increase wages of teachers this year. With that, teachers intend to go through with the plan to hold a protest on Wednesday, 20 March. After approximately hour and a half long meeting with Prime Minister Krišjānis Kariņš, Finance Minister Jānis Reirs and Education Minister Ilga Šuplinska, chairperson of Latvian Trade Union of Education and Science Employees Inga Vanaga said the offer from members of the government was not convincing. Šuplinska explained that the trade union was offered to add in the second reading of the state budget 2020 an agreement that if budget initiated and intensive work on optimization of the school network is performed, the government would be prepared to increase wages starting from 1 September 2019. According to Vanaga, the trade union did not receive any clear sign of the government having a clear plan for getting the necessary EUR 9.3 million for the implementation of the second stage of the wage rise plan. «We were told only about general ideas. But this information was not enough to convince us that every one of the possible steps carries positive fiscal contribution in order to amount to EUR 9.3 million,» said Vanaga. The prime minister said his government was formed with one objective in mind – sorting different state systems to provide residents with what they deserve – a good life in a Northern-European country. The prime minister reminded that three reforms have already been launched. Among them is also the education system’s reform. Krišjānis Kariņš stressed that the government invites the trade union to cooperate, not oppose. The government’s proposes adding to the budget draft an entry, stating that everything will be done to find the necessary funding to raise teachers’ wages from 1 September onward as long as promised reforms in the education system are performed and the state budget is compiled as planned. The prime minister also invited the trade union to work together, not against the Education and Science Ministry. «I can say only this – regardless of the trade union’s decision to cooperate or not cooperation – the government will move forward, sort out this system and ensure our children quality education and better wages for teachers,» promised Prime Minister Krišjānis Kariņš. Reirs, on the other hand, said that Finance Ministry in cooperation with Education Ministry and Environment Protection and Regional Development Ministry will seek solutions for financing of successful reforms. Kariņš had previously said the teachers’ wages problem is planned to be resolved in the 2020 budget. Saeima’s previously made decisions in regards to larger wages for teachers stated that the process will apply to the 2020 budget, «when the government will start forming its policy, not approve the budget purely technically,» the prime minister said. Refusing to accept this, the trade union turned to the European Commission, pointing to non-compliance with education industry’s law in the formation of the 2019 budget.